PhD candidates, Muhammad Asad and S.M. Masadur Al-Arif have won Best Paper Awards for papers presented at two leading academic conferences. Muhammad Asad and S.M. Masadur Al-Arif who are pursuing PhD degrees in the Computer Vision Group of the Department of Computer Science, have received Best Paper Awards for research presented to two leading conferences this year. City's Computer Vision Group is a constituent part of the Research Centre for Machine Learning. 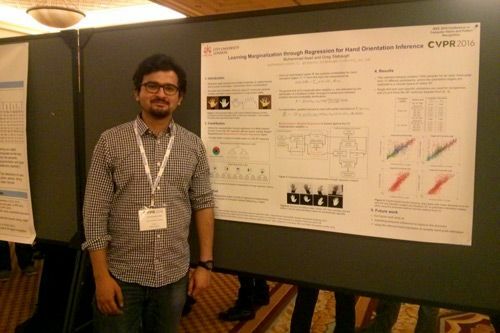 In June 2016, Muhammad attended the 29th IEEE Conference on Computer Vision and Pattern Recognition (CVPR) in Las Vegas, USA. This leading conference in its field included the 2nd Workshop on Observing and Understanding Hands in Action. His paper, “Learning Marginalization through Regression for Hand Orientation Inference,” was co-authored by Dr Gregory Slabaugh, and won the Best Paper Award at the workshop. The paper presented a novel machine learning model that enables a computer to understand and describe the orientation of a human hand by looking at colour images of it. "Our approach facilitates machine learning models in order to build a good understanding of a given data set despite the presence of variations arising from different sources. This work is currently focused on understanding hands. That said, the method can be extended to enable computers to learn complex problems. It was an overwhelming experience to receive this award, especially given the excellent work presented at a workshop dedicated to understanding and observing hands from images. I was delighted to receive the award and get recognition from senior researchers who have inspired me to explore this research even further." In September 2016, Arif attended the 19th International Conference on Medical Image Computing and Computer Assisted Intervention (MICCAI), the leading medical image computing conference in the world, which was held in Athens, Greece. The conference included the Fourth MICCAI Workshop on Computational Methods and Clinical Applications for Spine Imaging. Arif's presentation was titled, “Global Localization and Orientation of the Cervical Spine in X-ray Imaging”, co-authored by M. Gundry, K. Knapp, and G. Slabaugh. 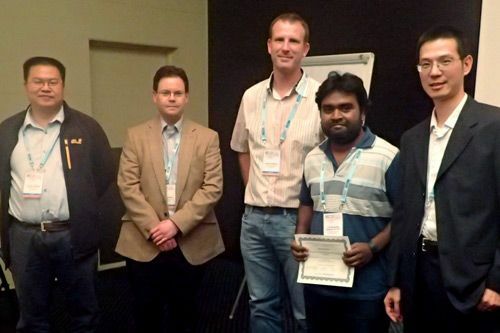 The work, in collaboration with the University of Exeter won the Best Paper Award at the workshop. Missing injuries in the cervical area can lead to neurological deterioration, paralysis and even death. This work is a part of bigger project, where the overarching goal is the creation of software that can help emergency room physicians to detect vertebral fractures with better accuracy. This has the potential to improve healthcare outcomes for emergency room patients who have sustained a neck injury. Arif says that, "with the help of machine learning, we have presented a method of teaching the computer to locate the spinal column in X-ray images. The framework learns what the spinal column looks like from expert annotated example X-ray images, and is able locate the spine on unseen images. This work is currently focused on the cervical area but can be extended to other parts of spinal column." For him, winning the Best Paper Award was "an amazing opportunity for me to present my work at a workshop dedicated to spinal imaging." "I’m delighted that Asad and Arif have received these Awards. This is a testament to the innovative, high quality research being produced within the Computer Vision Group."